Rewarding "finders" to stop looting of archaeological sites? SKOPJE, Macedonia: Authorities have seized dozens of stolen ancient artifacts after raiding the homes of two suspected antiquities smugglers in southern Macedonia. Police confiscated about 70 archaeological items, including coins, terracotta figurines, pieces of silver and bronze jewelry and amphora dating from the Hellenistic and Roman periods in the 4th and 3rd centuries B.C. [...]They are believed to have been stolen from Isar, one of Macedonia's largest archaeological sites in the south [...]The artifacts were found in the homes of two brothers who had previous convictions for antiquities smuggling [...] Macedonia has some 6,000 registered archaeological sites. Experts warn that since the country gained independence from Yugoslavia 17 years ago, the antiquities have become increasingly vulnerable to looters who use sophisticated navigation and excavating equipment. This is a typical example of what happens in poor nations in the Near and Middle East. Peasants and the such often have to resort to digging up and selling antiquities to the Black Market, in order to make a living. This statement is a typical example of the sort of arguments used by collectors to justify their buying artefacts which have been excavated from archaeological sites in disregard of the laws which are established by cultural nations to protect the archaeological heritage from needless destruction. Collectors pretend its an act of charity, they soothe their consciences that they are putting money into the pockets of needy subsistence diggers among the disadvantaged peasantry of the developing world. They are deluding themselves. Studies show that most of their money goes into the pockets of the dealers, and the middlemen and smugglers whose anonymity the former are careful to shield. Some of the latter clearly have close connections with organized crime and are involved in other criminal activity too. These shady middlemen and fat US dealers are in no danger of starving if nobody bought looted antiquities from them. According to Paraskevaides when these criminals are caught the authorities of the country whose archaeological heritage is being looted "embark on their spectacular punishment of such individuals" which they allegedly do "in order to save face to the outside world.....What a fruitless exercise!". Is punishing law-breakers fruitless? what makes it less effective as a deterrent is that regardless of the punishment of foreigners for such offences, western dealers will buy undocumented and contextless archaeological material from them knowing full well the likely origin of most of it will have been in clandestine digging and illicit export. They do so knowing that careless collectors will continue to buy such dodgy commodities no-questions-asked. Would it not be more appropriate to provide financial support and renumeration to antiquity finders in particular, thus negating the illicit trade?! He seems not actually to have read what this so-called typical case involves. What was apparently being traded here were not the odd accidental find made by a toothless Macedonian peasant by the chicken coop in his own backyard and sold in the market in the nearby town alongside free-range eggs. These are alleged to be objects deliberately looted from a known and registered site in southern Macedonia and sold by diggers with "sophisticated navigation and excavating equipment" to two brothers who are known to have been previously involved in supplying theme to the foreign collectors' market. Why would Mr Paraskevaides wish the individuals involved in this case to be rewarded by the cash-strapped Macedonian state? Would this really stop the looting of sites like Isar (or Isin in Iraq)? Would such a system really put an end to the international trade in clandestinely excavated antiquities? Of course not, because if the Macedonian government was buying looted antiquities from the looters at fair prices (market value), like the UK's various Treasure laws it would be so that they could be curated in public collections in that country. It would not be so they could then be bought and sold by Mr Paraskevaides (Bidancient) and his foreign antiquity dealing associates. The legitimate antiquities for which the "finders" received a reward would stay in Macedonian museums, and foreign dealers would have to seek their goods elsewhere. Nothing in fact would change, western collectors would continue to buy artefacts of unverified provenenience just as before but due to a system of rewarding artefact hunters the Macedonian state and the Macedonian archaeological heritage would both be progressively the poorer. In a wickedly elegant and well argued essay, tireless campaigner Dr Kwame Opoku raises a number of extremely pertinent points about the accusations thrown out by the Universal Collection advocates who oppose the repatriation of cultural property taken under dubious circumstances from other countries. In particular he cites the recent provocative book Who Owns Antiquity? : Museums and the Battle over Our Ancient Heritage by James Cuno, the publication of which has emboldened a few wannabe clones in the collecting world to join their voices to the clamour against “retentionist nationalism” and the policies lying behind the 1970 UNESCO convention. gives countries such as Ghana, Nigeria, Cameroon a certain amount of control over their own resources and cultural artefacts. These opponents of nationalism turn out almost invariably to be persons who would like to see the world governed by the forces in place. They would like to have a free-for-all situation where the stronger get what they want and the weaker ones can go to hell with their complaints. any evidence that nationalism has any deleterious effect on restitution or on culture except that it prevents the large museums from continuing their old practice of taking objects from wherever they want. It also appears that they resort to accusations of nationalism only when there is a discussion on restitution of stolen or looted cultural objects that are in the so-called “universal museums” in the western world. We are still awaiting their explanation why nationalism in the case of claimants is somehow less respectable but not in the case of the western retentionists who are hanging onto stolen or looted property […] Cuno and his supporters should bring evidence why “retentionist nationalists” in some countries - Egypt, China, Turkey, Greece, Italy and Nigeria - are to be suspected in their motives for demanding restitution but “retentionist nationalists” in USA, Great Britain, Germany and France are not to be questioned in their motives for holding on to looted or stolen cultural artefacts. Last week the Archaeological Institute of America, Lawyers’ Committee for Cultural Heritage Preservation and U.S. Committee for the Blue Shield announced that “the United States Senate voted on September 25 to give its advice and consent to ratification of the 1954 Hague Convention for the Protection of Cultural Property in the Event of Armed Conflict”. Hooray, but not before time. Its a 54-year old document. The Convention together with its two protocols of 1954 and 1999 establishes the principles for protecting cultural sites, monuments and collections during both armed conflict and military occupation. The United States was one of the few countries with a significant military force and significant extraterritorial ambitions that has not ratified this important international document. Some idea of the difficulties the cultural heritage protection community had over the last half century in getting the US government to ratify this document is described by the U.S. Committee of the Blue Shield (History of the 1954 Hague Convention in the U.S.. There is also an interesting article giving some background information (J.A.F. Nafziger Protection of Cultural Heritage in Time of War and its Aftermath. See also the pertinent comments by Larry Rothfeld here. The US however has not of course been alone in dragging its feet over this Convention. While it is true that Great Britain has announced (May 14, 2004) its “intention to ratify the 1954 Hague Convention and accede to both its Protocols”, symbolically on the 50th anniversary of the Convention (as if that made the delay any the more acceptable), as far as I am aware seems not to have actually done so. The DCMS website explains rather feebly that “the UK decided not to ratify the Convention when it was first drafted because, along with a number of other countries, it considered that it did not provide an effective regime for the protection of cultural property.” It was only (they explain) with the drafting of the Second Protocol in 1999 (in which the UK was involved) that created conditions “that would enable the UK to ratify the Convention”. It took them another five years to tell the world that however. In the meantime they took part in the invasion and occupation of Iraq along with fellow non-ratifyer the US (but involving in their coalition nations - like Poland - which had). The UK's initial announcement was then followed by a long process of creation of “consultation” documents (why were they not compiled before the announcement?) Only in January 2008 did the UK Government publish the Draft Cultural Property (Armed Conflicts) Bill "which is required to enable the UK ratify the Hague Convention and accede to its two protocols". Let us see how long it takes the United Kingdom to pass beyond drafts and consultations and actually put the measures into practice. What's the betting the UK troops will be back out of Iraq before then. Please visit my store [...]. I have fibulas, lock tumblers, spear and arrow heads, bracelets, medical or sacrificial instruments, Provincial and Imperial Roman coins, finger rings, Celtic proto money, and various unique, one of a kind, artifacts. I try to maintain over 1000 items in my store so you will have a good selection”. and another two here and here, all four with a starting price of 99 dollars. The photos shows typical groups of “partifacts” such as are found by metal detecting on Roman and medieval sites. The seller has “many pounds of these artifacts available […] and more of these auctions in my ebay store at the same price for 3 pounds of items”. In Bulgaria, there are artifact searchers that search with metal detectors every day that weather is permitting. They search around Vidin, Bulgaria and the surrounding area. They find all sorts of items from over 20 centuries of rich Bulgarian history. They find complete great artifacts many times. I have many of these listed in my store. They also find many pieces of artifacts that have less of a value. My supplier, who purchases these items directly from the persons that find them, has been saving these types of items for over 5 years. I have purchased over 2000 pounds of these items. I will be selling these in small lots over the next year or so on a weekly basis. These lots have been searched thru to attempt to pull out any items that are less than a couple of hundred years old. The items are mostly metal, mostly bronze with good patinas. These lots contain many ancient items including Celtic, Roman, Greek, Byzantine and Medieval periods. The US seller’s “2000 pounds” is just over 907 kilogrammes of archaeological artefacts with a total retail price of 66000 dollars. One wonders how many collectors buying this material are at all interested in how this stuff got to the US. I wonder how many assume they are from from legal exploitation of Bulgaria’s archaeological record and by legal export (no mention is made in any of the descriptions of the material for sale of any export licence). Few serious collectors can fail to be aware that the archaeological record of Bulgaria is suffering greatly from looting of many of the country's archaeological sites. I wonder how many of Mr Harris’ customers will have stumbled across Diana Simeonova’s article from April 5, 2006 “Looting and Smuggling Ravage Bulgaria's Cultural Heritage Sites” which refers directly to the scale of the looting around Vidin itself. Treasure-hunting has become a profession in Archar, in north-western Bulgaria, where the 1,500 inhabitants, like many others around the country, earn their living by digging up and selling precious finds from the buried Roman settlement of Ratsiaria. "Treasure-hunting has gone wild since the state went bankrupt in 1989 (with the fall of communism). Police were downsized and demotivated while looters got literature, catalogues and modern scanning equipment," Bozhidar Dimitrov, director of the National Historical Museum in Sofia, told AFP. "It is the whole village that is digging out there […] 99 percent of the mostly gypsy population is unemployed," Antoaneta Nikolaeva, an expert at the History Museum in the nearby town of Vidin, said. […] Treasure-hunting fever broke out in 2000, locals told AFP. At night bulldozers combed the area around the village as people sifted dirt for precious objects. […] Six years later the area around Archar resembles the surface of the Moon, with furtive silhouettes disappearing at the sight of approaching cars. […] Some 300 cases have been filed against looters at the Vidin regional court alone but due to slow and inadequate legislature few sentences have been given out, court data show. Out of 15,000 ancient burial mounds in Bulgaria, dated between the 4th century B.C. and the 3rd century A.D., two-thirds have already been ravished and precious archeological data lost forever, Dimitrov said. "Digging is usually followed by smuggling abroad […] Vienna, Munich, Frankfurt and auction houses in Italy and Britain are major centers for trading Bulgarian antiques”, Dimitrov said. A similar picture is presented by other newspaper articles such as Malcolm Moore’s Tomb raiders strip Bulgaria of its treasures (Daily Telegraph 29 Aug 2007 - the Byzantine plate mentioned is discussed in the Looting matters blog). The sale of even the scrappiest of scraps left over after middlemen and dealers have been cherry-picking the bulk lots bought from the artefact hunters seems an ample pointed to the collectors' market being the main motor of the digging. The collectors who buy this stuff no questions asked thus providing a market for hundreds of kilogrammes of it are responsible for the looting as much as the looters themselves. many of the digs are organised by the local mafia. Volodia Velkov, the head of the police unit that combats organised crime, said tomb-raiding was now generating about £4 billion a year for the crime syndicates [...] "Since last October, when we started the new department, we have seized 16,000 artefacts," he said. "More than 30,000 people are involved in tomb-raiding. The business is very well-organized and the expeditions are financed by rich Bulgarians living in the US, Britain and Germany [...] The main [smuggling] route is through Germany, where there are huge warehouses full of our antiquities," said Mr Velkov." The recent report "Organized Crime in Bulgaria: Markets and Trends" (pp 172-198) places antiquities smuggling alongside drug and human trafficing, vehicle theft and other similarly dubious business opportunities. One wonders about the identity of this "supplier" whom Mr Harris deals with who "purchases these items directly from the persons that find them". Are these really the people his buyers are sure they want to be putting money in the pockets of? Should not any buyer of portable antiquities be concerned that the things they buy do not come from the "huge warehouses" full of looted Bulgarian antiquities by asking the supplier to show verifiable documentation of their legal origin and export? On Friday September 14th 2007, the Heritage Action Erosion Counter ticked to the figure of ten million, “being a conservative estimate of the number of recordable artefacts removed from our fields and scuttled home with or flogged by metal detectorists, the vast majority without a word to anyone else”. On Friday 26th September, just over a year later the counter passed the ten-million–three-hundred-thousand mark. The significance of this is that until recently the Portable Antiquities Scheme was boasting that in ten years of outreach they had managed to get records of 300 000 finds from ALL members of the public (including metal detector users) in England and Wales. In other words eight million pounds and a lot of work is managing to mitigate just over 10% of the losses occurring week after week, month after month to the British archaeological record. No doubt “metal detectorists” will claim that the HA figures are unreliable (admittedly they are indeed a model, nobody really knows how many artefacts are being taken away without anyone knowing about it – because nobody knows about it except the silent takers). “Metal detectorists” will claim that HA don’t take into account that most of what they find is "rubbish" (they cannot read enough of HA’s small print to see the word “recordable”). In fact, this rate of erosion represents the equivalent of each collector finding just thirty archaeological artefacts (including Roman “grots”) a year and either keeping them, selling them, or discarding them in the field unrecognized or “uncollectable”. Many collectors haviung access to a "productive" site or two and going on a few metal detecting "rallies" a year annually probably add far more artefacts to their personal collections than that. One "metal detectorist" in the Bristol region for example reports that he has recorded with PAS alone, "300 recordable finds each year". 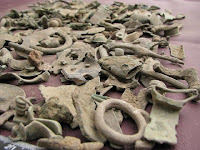 Other personal collections made by "metal detecting" are known to contain thousands of archaeological artefacts. I think the HA counter is in fact a rather conservative estimate. A few years ago the Heritage Lottery Fund ran a "heritage heroes" award to celebrate the important and vital role volunteers play in delivering successful heritage projects which have brought about huge benefits for the heritage of the UK. The 2005 and 2006 awards are reported rather modestly. On 17th January 2007, at the launch of the 2004 Treasure Report, David Lammy (Labour MP for Tottenham and Minister for Culture under Tessa Jowell at the Department of Culture, Media and Sport) as part of that government’s emphasis on “social inclusion” called British metal detector using artefact hunters and collectors ‘the unsung heroes of the UK's heritage’. Unlike the first set of awards, this was relatively widely reported by the media. Writing in the Guardian the next day, Maev Kennedy ('Unsung heroes of heritage' extolled for unearthing hoard of treasure) predicted that ‘the phrase will cause a sharp intake of breath among some archaeologists who still regard [detectorists] as little better than legalised looters’. She was wrong. It passed with relatively little comment in the archaeological world in Britain, most of whom are resigned to friendly collaboration with all and any artefact collectors and hunters since they apparently have little intention of facing conflict by trying to curb their activities. Most of them, like the Council for British Archaeology have adopted a conciliatory approach to metal detector using artefact hunters and collectors, preferring to praise “responsible detectorists” rather than point an accusing finger at bad practice or examining too closely the archaeological implications of its wider context with the antiquities collecting and the global antiquities market. Thus it was that the CBA took issue only on the point that not ALL collectors are “heritage heroes” – why? Because not all of them show the archaeologists what they’ve taken. [Also of course Mr Lammy was forgetting Scotland which has separate legislation and is not covered by the Treasure report he was discussing]. Even the more ‘serious’ papers are encouraged by such remarks to carry articles with titles such as “Buried treasure is yours for the taking” (Mark Bridge in the Times March 24, 2007) and Archaeological finds 'up by 45%' (BBC News 17th Jan 2007). So much for British “investigative journalism” and giving the reading public a rounded picture on which to form judgements. Certainly there is no hint in them that the people who dig up artefacts long buried in the soil would be better advised to leave them where they are for others to enjoy finding at a later date. That's what divers are so often told. When did you last hear a diver described as "heroic" for recovering the bell from a long-lost wreck? He or she may have had to carry out a great deal of research and overcome many obstacles to secure the find. How difficult is it to wave a metal detector? [… This] seems to be a case of double standards in perception, between the heroic coin-shooters rummaging about on land and villainous divers rummaging about at sea. My thoughts exactly Mr Weinman. It seems to me that this comment by David Lammy reflects some extremely woolly thinking by British archaeologists and policy-makers. At the end of June 2007 David Lammy ceased to be Culture Minister (becoming the Minister for Skills in the Department for Innovation, Universities and Skills) and by December the same year was using the word “unsung heroes” in another context. The British media really do not know what to make of artefact hunting and collecting. This is not surprising since British archaeologists don’t seem to have much of a stomach to take a lead on this matter and there is a government supported Portable Antiquities Scheme sending out utterly ambiguous messages. Instead of informing public opinion, most journalists take an easy way out. A good example is the approach of the media to the tale of Hampshire metal detector using artefact hunter Peter Beasley who we learn from the second article quoted here has been searching for archaeological collectables in the area since 1976.
and a Roman pen. Married Peter, 62, of Waterlooville, Hants, said: “It is exhausting so you can only do it for four or five hours a day". Archaeologist discovers Saxon burial site in field: An ancient burial site of international archaeological importance has been found in a field near Clanfield. [...] It has been estimated that there could be 3,000 graves in the 15-acre site. This is perhaps not surprising as the field lies not very far from the Chalton Anglo-Saxon complex a major excavation of the early 1970s (and indeed the same family owns both sites. The discovery began when he found a shield boss which was approximately 1,400 years old. He was convinced there was more to find in the vicinity and went on to find spears, the skeleton of a young woman from the 5th or 6th century and, nearby, a warrior from about the same Saxon or Jute period. [...] The location of the site has not been revealed as both the landowner and Mr Beasley are concerned about its security. A treasure-hunter who hoped to make his fortune after stumbling across an ancient graveyard is distraught after being banned from the site. Peter Beasley, a retired bricklayer, thought he had struck gold when he uncovered part of a Saxon shield, spears and a skeleton while out roaming with his metal detector near Clanfield. The 67-year-old believes the 15-acre site is worth millions, hiding precious jewellery, ancient weapons and up to 3,000 graves from the seventh century. But his stake to the treasure has been dealt a bitter blow. 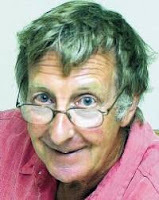 The landowner has told him he is no longer welcome on the site – even though Mr Beasley claims an agreement was made to split the finds 50/50. […] Mr Beasley said: 'I think it's disgusting. I have been going there eight years. A fifty-fifty split of the proceeds of selling off Anglo-Saxon personal ornaments and weapons on internet auction sites and to dealers? Cash from Anglo-Saxon personal posessions ripped from people’s graves? From the dismantling of an archaeological site apparently of [inter]national importance? Well, thank goodness the landowner had second thoughts. “The landowners, Mr and Mrs Budden, […] said they had no intentions to dig up any of the treasure as it had been designated a Site of Special Scientific Interest”. Even so, they are fed up with metal detector users looking for treasure trespassing on their land because they know this cemetery with potentially rich pickings lies on it. Of course these clandestine and illegal artefact hunters have no trouble finding buyers for their loot in the current no-questions asked market. So what is Mr Beasley’s quoted reaction to that? According to the Portsmouth News, he says it wasn't just about the money. Ah, so its David Lammy’s ill-advised “heritage hero” accolade of metal detectorists as a whole come back to haunt us. By taking all these artefacts out of their archaeological context in the ground and scattering them through numerous ephemeral personal artefact collections, artefact hunters like Mr Beasley claim they are doing a “service to the country”. Yeah, right. The stolen eye from a monumental statue in Amenhotep III’s funerary complex at Kom El Hetan which is being returned to Egypt now appears to have been formerly incorporated in the Norbert Schimmel Collection some of which, including this eye were sold at Sotheby's in New York on 16 December 1992, Lot. 87. The catalogue entry at that time, significantly, mentioned that this eye came from “a Colossal Quarzite Statue of King Amenhotep III”. Monumental quartzite statues of this ruler however are not scattered in large numbers up and down the length and breadth of the Nile valley; known examples are relatively few and far between. In fact it seems that most of them come from the funerary temple at Kom El Hetan and the adjacent funerary complex of Merenptah excavated by Petrie in the 1890s, and one turning up buried in the courtyard of Amenhotep III colonnade of the Luxor temple in 1989. Surely a collector being offered one of these things might be expected to ask where it had come from and some documentation showing how the seller had legitimately come into possession of such a find? Moreover if it had come on the market legitimately, surely this hefty fragment of regal visage would have been traceable in the literature? This is not after all a Second Cache shabti that can be slipped in a Nile cruiser’s cabin luggage. Would the fact that it is not give rise to a suspicion that there are problems with its provenience? So why would a collector not have this in mind? In another post here today, I discuss the effects on the archaeological record of a large expanse of the northwestern part of the African continent of the gathering up of archaeological material for sale to foreign collectors who are basically uninterested in where it came from and how it got into the big box of mixed goodies the seller in his own country offers to him at "reasonable prices". The archaeological issues have however analogies in those connected with other areas of collectorship. The same northwest African markets for example provide western markets with many fossils. It would seem though from the numbers of doctored and false specimens now appearing on the market that some of the previously more accessible sources are drying up. In other words, they have been collected away. A more informative analogy however is with the surface collection of meteorites in the Sahara. A few years ago meteorites were relatively rare on the market and specimens fetched high prices. US collectors however were finding a number lying on the surface of arid regions in their own country (they stood out by colour, shape and texture from other stones and also were relatively stable in arid environments). 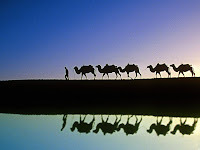 Then some enterprising dealers realised that the deserts of other continents would be a good source of the commodity. So they began to make contact with dealers of geological specimens and persuade them to get desert wanderers to pick up the types of rocks they were interested in buying. Very soon this stuff started flowing onto the market in huge quantities. prices dropped, once a rare material, space rocks were now sellable for a few dollars a kilo. Now instead of being a highly-prized material accessible to only a few monied and well-connected collectors, they are now being collected by all and sundry and due to the glut, even used for making novelties (jewellery, watches, cut into novelty shapes). The availability of cheap material has allowed a substantial expansion of the market, new collectors are being enticed into the fold by various means which can only be good news for the dealers, its probably good news for the Bedouin (until the resource dries up) - but is it good news for the finite resource involved? The situation is entirely analagous to the current state of the portable antiquities market, the expansion of which is encouraged by the ready availability of "minor" (sic) artefacts brought to light with metal detectors and with huge international oureach through internet auction and sales sites. In fact the similarities are so great that many of the arguments used by meteorite dealers and collectors to justify this personal collection of 'Rocks From Space' are exactly those used by dealers and collectors of 'Pieces of the Past'. There is no space to develop this here (which I hope to do elsewhere), but a few points need to be made about the material coming from somewhere in the Libyan and Algerian desert and surrounding areas currently being sold euphemistcally as "NWA" (Northwest Africa) material. Meteorites are named by the place of discovery (where they fell). Stones from the fragmentation of the same meteoroid are grouped together under that name. An example is the Park Forest meteorite that fell on the outskirts of Chicago. This fragmented in the atmosphere and the pieces fell in a particular pattern (see Figure) which make up its "strewnfield". The study of the information of this pattern allows us to say something about the trajectory of the object and how it broke up (not without significance in studying the mechanisms of breakup on entry into the atmosphere of other objects from space, such as returning space vehicles and satellites). The pieces of a single meteorite can be studied together, the weight of recovered fragments determined and other such information obtained. The situation with meteorites picked up "somewhere in the Sahara" and sold as part of a mixed bulk lot through a dealer in Marocco tell us nothing, other than a stone of a particular type fell some time in the somewhat large area known as "Northwest Africa", and now can be bought for a dollar a gramme from a Chicago dealer. Collectors of these cut-price 'Rocks From Space' scoff at the idea that there is some form of technique and ETHICS that should be applied to collecting from strewnfields in the same way as many collectors of "Pieces of the Past" scoff at those who desire them to keep an account of provenance of the objects they covet. Meteorite collectors buying mixed lots of NWA material totally ignore the destruction of information for which their cupidity is directly responsible (just the same as those who deny that collecting of portable antiquities has any connection with the exploiting of archaeological sites as a source of collectables). Given such attitudes, the Bedouin collecting these rocks have no incentive to collect any information in the field on the strewnfield patterning of the material, since dealers know that private collectors will buy the loot regardless (they are not even overly interested that they cannot even learn which country or region the stuff fell in). Indeed, there are good commercial reasons for the finder keeping the actual findspot a secret. One of the most interesting and prolific of the NWA finds is the meteorite NWA 869, all that is known of it is that it was found (for most of it has now been collected away) at "Tindouf" on the Algerian-Maroccan border. Like the collectors of "Pieces-of-Other-People's-Past", meteorite collectors scoff at the existence of laws restricting the exploitation of a scientifically significant resource for commercial purposes. Likewise they scoff at the existence of "retentive" laws restricting the movement of certain resources across international borders and prefer not to think too deeply about who might be generating cash from this trade and to what aims. Collectors raising ethical questions like Richard & Roland Pelisson are ridiculed by the average meteorite collector, on the whole totally uninterested in anything like this which gets in the way of their free and easy (and cheap) access to material from which to build their own personal collection for entertainment and profit. The strewnfield figure is taken from the webpage based on the article: L. Martell "Meteorite Shower in Park Forest, Illinois". There has been some disapproval in collecting circles of opinions supporting the epigram "collectors are the real looters" ([wrongly] attributed by them to Colin Renfrew). Indeed a whole discussion list has recently been set up by a dealer "to prove or disprove the Ren[f]rew Hypothesis (sic PMB) on Looting"... so far without too many collectors wanting to argue the point in detail. This is not surprising. Most normal people need little convincing that the inception of the disasterous digging into archaeological sites in places like Nigeria dates from the period when dealers started to express an interest in buying the fragments of terracotta figurines (as objects of fashionable "tribal art") which such digging provides. In Jiroft in Iran, locals expressed little interest in quarrying the ancient site until dealers began appearing there eager to buy the bits of old stone and pottery and looting then began in earnest. Such cases may be multiplied. Though dealers and collectors try to explain individual cases away by specious arguments, the overall picture seems pretty clear to most of the rest of us. On a collectors' forum yesterday there appeared the following announcement: "I can supply a large lot of neolithic arrowheads. Original items! Good quality no complete broken or junk points! I am selling this arrowheads for only $ 1 each + shipping costs. 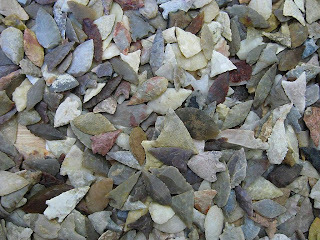 Minimum to take is 100 pieces [...] Nico sahara-arrowheads." The dealers' website is here and there are close up pictures of a box-full of the offered goods here and here. These are obviously the cherry-picked items from a larger assemblage of surface finds probably garnered from a wide region and cultural range - all mixed up in a box somewhere in a Dutch portable antiquity dealer's premises. Where have these items come from? How did they get to the Netherlands? It would seem from the way the dealer signs his message to English-speaking unprovenanced arrowhead collectors that he is saying that they have been picked up somewhere in and around the Sahara desert. As we know the region now occupied by the Sahara desert has not always been as arid as today. In the past much of the area was savanna and even forested and supported a rich fauna. As such many ancient human communities exploited the area and left traces of their activities. The archaeological remains of the area have a rich story to tell of the history of mankind, and also the response of these communities to serious climatic change (perhaps not a message without meaning today). A number of archaeological expeditions in this region - both of national institutions as well as collaborative international scholarly expeditions - have gathered substantial bodies of evidence from surface survey and detailed investigation of some sites. This information cannot however be obtained if the sites have been looted. In other words if groups of people have gone over them and removed or otherwise disturbed the distribution and other patterns of the artefacts they contain without record. This is what we have here. It seems most likely that the source of these items is Bedouin who go out into the desert and fill up their saddle-bags with the "stones" lying out in the sands. They go back to sites they know produce these items, they find new ones (unknown to science). They take whatever they can sell. They then take them to certain towns (sometimes crossing national borders) where there are dealers who have contacts with other dealers who form part of the chain to the western collectors' markets. It seems pretty obvious to most normal people that the main impetus for searchers to go deep into the desert to look for these "stones" and haul them acrss the vast expanses of sands is because someone somewhere will pay them a little money for them. These middlemen can only do this because at the other end of the chain of distribution are those willing to buy unprovenanced gee-gaws for their collection without asking any questions about where they came from. It seems undeniable that the carefree collector of such items (which are being supplied along with beads and bangles, Palaeolithic handaxes, polished Neolitic axeheads and other "collectables") without even a thought to what happens to the archaeological site - the only source of our knowledge of a community part of a great human culture - when these items were grabbed up and transported to a distant souk in a bag of thousands of others. I expect the collector will counter that the Bedouin's family and camels were fed with the money generated by this looting of archaeological sites and that probably they had no other source of income. Maybe. They may claim that the laws many of the countries concerned are "unreasonable and unjust" (prevent "private enterprise") and in any case "do not prevent looting" (that's rich coming from the collectors and dealers that finance the looting by ignoring their existence). This does not however change the fact that these laws DO exist, and that by ignoring them, dealers buying illicitly-obtained material which is in many cases seems to be illicitly exported from the source country, are financing illgal operations and putting money into the pockets of criminals. Collectors of course, and still less dealers in portable antiquities, do not see it this way. The dealers may say what they want, on the other hand we have statements from portable antiquity collectors in the US such as Nader Rastegar referring to “the flood of antiquities that we have all been witnessing” and “....though somehow mysteriously a steady stream of those items seem to be in possession of US Troops, and showing up in the USA!” So what is the truth of this matter? Well, we find that at least one archaeological item looted from Baghdad museum seems to have been seized at a US airport within days of the fall of Baghdad. Several journalists and one American soldier were under investigation. Matthew Bogdanos refers in his book to other stuff being handed over to him in New York when he returned from his Iraq mission. In November 2003 it was being reported that looted Iraqi artefacts had been found in London by the Metropolitan Police's specialist arts and antiques squad. A number of men had been arrested, including one at a central London gallery. 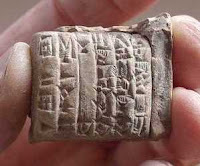 At about the same time as certain biased newspapers were suggesting in the summer of 2008 that the looting of archaeological sites in Iraq was reducing, two news items suggested that the role of the US market was by no means as innocent as the portable antiquities traders were suggesting. On the 9th June 2008 we learnt that eleven agate and alabaster cylinder seals stolen in 2003 from the Baghdad Museum had been seized by U.S. customs officers in Philadelphia in May and were handed over to the Iraqi embassy in Washington from where they were returned to Iraq. The circumstances of the seizure were - suspiciously - never made public. Now we learn from that on 15 September 2008 in a transfer ceremony at Iraq's embassy in Washington an even larger cache of unprovenanced archaeological artifacts has been returned to Iraq's government, thanks to a multi-year initiative by U.S. customs authorities to intercept items being smuggled into the United State. Iraqi ambassador Samir Sumaida'ie took possession of more than 1,000 rare objects, many of which date back to Mesopotamian times. The objects include inscribed ceramic pieces, figurines, tablets, and ancient coins. They were seized from smugglers who either hid the objects or misrepresented their country of origin to U.S. customs officials. In handing them over, Julie Myers the head of U.S. Immigration and Customs Enforcement said: "These items are much more than souvenirs or art objects - even though that is how people who tried to profit from them treated them; these are part of Iraq's priceless history".Presumably, the artifacts would have been put up for sale in the US had they not been intercepted. These however are just those items that were detected and intercepted. Despite the unamimous denials of those involved in this trade this collection of objects gives ample reason to assume that many more recently-looted items will have slipped through the net and entered the United States despite import restrictions are among those currently on offer as unprovenanced Mesopotamian artefacts on the western markets. How can one attempt to deny this? Do the dealers making such claims expect us to treat them seriously? * this one with the utterly curious suggestion “There seems to be every reason to think that a system broadly modelled on the UK Treasure Law and Portable Antiquities Scheme would find favor among the Iraqi people” (sic). Reference Matthew Bogdanos with William Patrick 2005, "Thieves of Baghdad: One Marine’s Passion for Ancient Civilizations and the Journey to Recover the World’s Greatest Stolen Treasures". Bloomsbury USA. ISBN 1582346453. Interestingly, it seems this "metal detectorist" has posted a number of his finds on the United Kingdom Detector Finds Database and they include an Anglo-Saxon coin which already a year ago was being questioned . This find was validated by the database administrators on account of the fact that it is die-linked to another coin which was already on the market in 2002 (which raises questions where that came from). The news of the upcoming court case has prompted comments on the "metal detecting" forums over the past few days how suspicious many other artefact hunters were (or now in hindsight are?) that the more interesting collectables such as gold coins, brooches and silver personal ornamets were being found on the sites searched even in "the quietest of fields" always by members of the inner circle of the Coventry detecting group (comments on Detectorist.co.uk by Lindum Searchers). There seems to be a vague suspicion in the milieu that some of the finds in the "metal detecting" meetings organized by the group to which this individual belonged may have been "planted" in the field for others to find. Who knows? Obviously, and irrespective of the outcome of this court case, it is clear that in the current situation on the British collecting scene, anybody with a metal detector can claim they found anything in any field they choose to say it came from, and with no form of documentation of circumstances of discovery, nobody would be any the wiser. This allows all sorts of scope for abuse, and allows room for the archaeological record to become contaminated by all sorts of false and unverifiable information. This could include the passing off of fakes as genuine finds, which may even be given provenances by recording them with schemes like the UKDFD or PAS or by British museums. Whether or not that was what happened here time will tell. Certainly the development of this case would repay watching closely. The next news item is about the National Trust policy document “Metal Detecting on National Trust land” (apparently in existence since at least 2003, so hardly “news”) is described as a “Typically Negative Atitude (sic)”. This policy is of course concerned with preserving the heritage values of National Trust land, instead the FID artefact hunters characterize this policy as having arisen due to “those small minded people who cannot behave in an adult manner who try undermine the good work of detectorists and archaeologists alike”. They add disingenuously “It is well to remember that the past belongs to everyone not just any particular small minority interest”. Quite, and the aim of the National Trust of course is of course to preserve those heritage values (“for ever, for everyone”) so they can be managed for everyone’s benefit and not stripped away by some selfish individuals to add to some garden shed collection or sold on ebay. The accompanying text makes clear the problem. Although collectors are taking away so many items, very few of them are being reported to archaeological bodies and therefore any information that accompanied their discovery is completely and irretrievably lost. In the time since the PAS was set up, the counter shows that nearly three and a half million objects have been taken by metal detector using collectors, and yet in that period PAS and the Scottish Treasure Trove Unit have had reported to them something like one tenth of that number of objects. According to these figures therefore, ninety percent of the finds made with a metal detector by artefact hunters and collectors in UK fields are just disappearing into domestic and foreign ephemeral personal collections without any record being made. Heritage Action call on those concerned to remedy this situation. “I hope to launch a similar internet site dedicated to countering the propaganda put out by Heritage Action; and ensuring that the media, politicians, tax payers, landowners, farmers and anyone thinking of taking up metal detecting as a hobby, have easy access to the true facts about the heritage industry. Those who run Heritage Action are totally dedicated to the destruction of the metal detecting hobby. They cannot be deflected from that task by appeasement ... by cow-towing ... by keeping a low profile. The only way to beat them is to hit hard with the facts they do not want excavated and brought to the attention of the media. I can do that ... but not without help from you with the costs of research, which involves travel to and from archives, as well as laborious searches of archaeological records and journals over many, many years. ”There then follows an appeal for funds. We wonder how much money Mr Fletcher has received to counterattack what he labels “the heritage industry”. What is however interesting is Mr Fletcher, though he obviously regards these numbers produced by Heriage Action as some kind of threat to the image of metal detecting, does not say he is going to set out to prove that the figures presented in the erosion counter are wrong. He is not going to attempt to prove that it is not true that ninety percent of UK detector-made finds are unrecorded. Instead he is going to try to dig up some dirt on the whole “heritage industry”. He announces he is going to pore over archives, and conduct “laborious searches of archaeological records and journals over many, many years” to uncover and disseminate through the media facts which he is sure that heritage professionals will find embarrassing. What is not clear however is quite what he thinks this will achieve. It is also less than clear why he does not see that his aims and those of the organization he imagines he will damage by such activity are so far from one another. Heritage Action itself is dedicated to showing where the professional, government, response to threats to the heritage is totally (in the view of its members) inadequate to the task. Mr Fletcher could therefore start his search on their webpage as their aim and his seem related. The problem for Mr Fletcher is that Heritage Action shows that the British government response to artefact hunting and collecting and the illicit antiquities trade in Britain is indeed completely inadequate and much is being lost without record. Maybe, however, instead of attacking heritage concern organizations who point this out, Mr Fletcher and the FID should be considering instead what they could be doing to remedy this. * The Heritage Action counter and the figures on which it is based were consulted with the author of this blog who has been actively researching UK “metal detecting” for some years. Since the counter was installed, new evidence has come to light which shows that this estimate is in fact far too conservative, the true numbers turn out to be even higher (publication in prep/forthcoming). Who is being "Greedy and Acquisitive"
them? Isn't the Italian attitude, mine mine mine, just the "greed" of collectors writ large, and backed, ultimately, by the armed might of the modern state? This comment totally ignores one vital piece of information about these objects. In the case of the material which is the subject of the Nostoi exhibition, Italy cannot be labelled as a “greedy acquisitive nation”. All of the archaeological material which has now been returned had not fallen out of the sky into Italy before it was smuggled out of the country. It was dug out of the archaeological record within the area administered by that state. It was then removed illegally from that country by people who presumably knew full well that they were breaking the law. It was bought by “greedy acquisitive” collectors who failed - despite all the warning signals - to check properly where the material had actually come from. It has now been returned to the place from which it was taken as, it is beyond a shadow of doubt, the product of illegal activity. As such, some of the consequences of that illegal activity have been undone, though the damage done to the archaeological record of Italy to produce a few saleable collectables is irreversible. There are many more items in US and other collections that derive from the same spate of illegal activity and let us hope that “truth, justice and all that stuff” will eventually prevail here too and the material will find its way back to the place from where it was illegally taken away. Why anyone would want to condone illegal activity and label those who oppose it "greedy and acquisitive" is beyond me. Phil asks why I would “gloat” along with the citizens of Italy that this material has been returned to that country. I am not gloating at all. I am appalled by this whole sorry business. I am appalled by the destruction of achaeological evidence that the Geneva Freeport photos for example reveal. I am appalled (as anyone who cares about the past would be) by the stories about the smashing of painted pots by diggers and dealers so they can be bought as parts of job lots by foreign museums and fitted together again. I am appalled by the trail of destruction caused by the commodification of information about the past as trophies of “ancient art” and the falsehood and hypocrisy involved in the trade of hiding of the true origin of these objects. That is by no means a legitimate trade. One may be grimly satisfied that some of those responsible may have been caught and punished, but we are all aware that this is just the tip of an iceberg (for example according to David Gill the Nostoi material accounts for only 1% of the Geneva evidence), and that is a cause for despair, frustration and real anger. The public deserve to be shown the Nostoi material, and praise given to those that, through very difficult, time consuming and frustrating investigative work traced this portion of the material, led to its recovery and the apprehension of some of those believed to be involved. Let the exhibition serve to show the public (who pay for these investigations) the importance of continuing this work to the bitter end and bringing all involved to account. Let the international community viewing this exhibition think very deeply about the antiquities and “ancient art” trade. In particular about its effects on our ability to recover information about the past of the region this material has been looted from, taken from the local heritage of those that live there. That is the knowledge I and other archaeologists would like to see advanced. US Dealers' New Cunning Plan? American portable antiquity collectors are desperately trying to convince public opinion and lawmakers of their message that they are doing „nothing wrong” buying unprovenenced ancient artefacts without documentation of licit provenience. In fact they even have the nerve to try and persuade us that what they are doing is for the “good of mankind”. The fact that the US State Department along with the rest of the world disagrees with their illogical assertion that “ancient coins are not archaeological finds" and included them in the Cyprus MOU has been the basis of their allegations that there has been some secret government conspiracy against them followed by an attempted 'cover-up'. They try to represent efforts by conservationists to stem the flow of illicit artefacts as an attempt to stifle their “avocational scholarship”. They allege that conservationists trying to stem the trafficking of illictly obtained artefacts are mere mouthpieces of an ideology of “retentionalist nationalism” and worse. They assert that collectors of unprovenanced artefacts are having to struggle to “preserve, study, display and enjoy” cultural artifacts” in the face of what they call an oppressive "Archaeology Uber Alles" perspective. They so far seem mainly to have succeeded in deluding only themselves. It seems to me that perceiving that they are not going to get very far with their current efforts, they’ve recently changed track and apparently hatched a new “cunning plan”. Part of this new plan on has been to set up another action group. This one is to debate what its organizers call the “Renfrew Hypothesis on Looting” (sic). This is connected with somebody (they say it was Colin Renfrew but it was not) formulating the epigram of the truism “collectors are the real looters” – referring to collectors of ancient artefacts without documentation of licit origin. The US collectors’ lobby feel uncomfortable with this and denies strenuously that this is true. This group has been set up with the obvious aim to prove the case. The arguments are weak and specious, but no doubt the Renfrew-L chapter of ACCG and its hangers on will be trying in future to persuade us that everybody has got it wrong. Oh, and its another pro-collecting discussion group with an ambiguous name. There already is a “Renfrew-L”.